My favorite kind of adventure stories don’t feature daring escapes from wild animals or treks into distant jungles. I am more drawn to ordinary people who take risks to follow their dreams, and if those dreams involve a few lovable dogs, all the better. 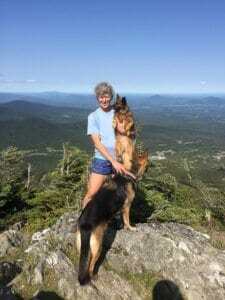 Shirley Harman lives with a pack of seven dogs, and in 2016, at the age of 58, she embarked on a remarkable journey with Tina, a nine-year-old mixed-breed terrier, and Lyssa, an 85-pound German Shepherd. First they drove 3,500 miles from California to the Canadian/Vermont border. 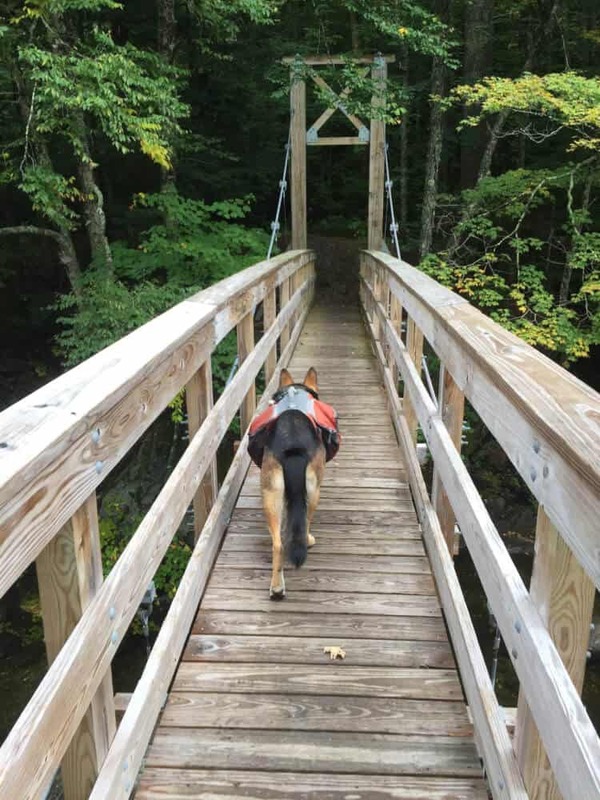 Then, they trekked 275 miles on the Vermont Long Trail from the northern border to Massachusetts. The Long Trail is America’s oldest long-distance hiking path, and was completed in 1930. 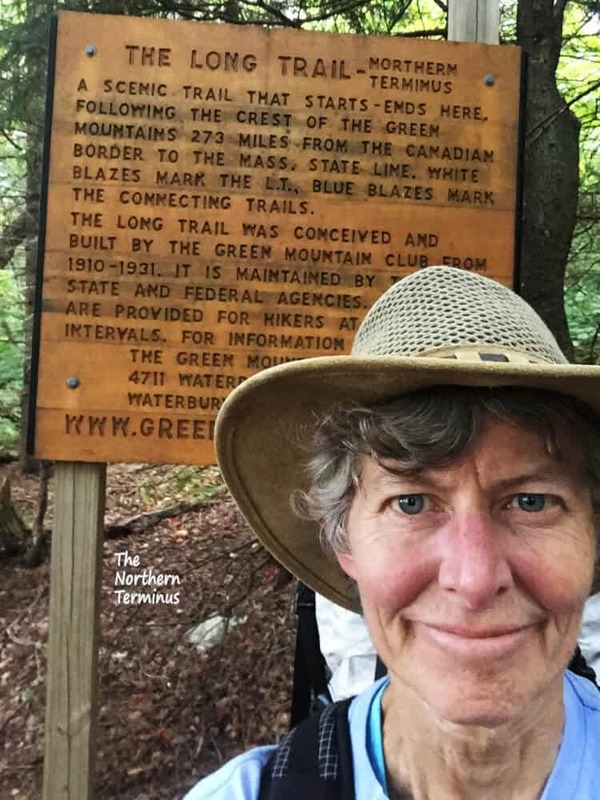 Shirley began her trek on September 2, 2016, and spent three weeks putting one foot in front of the other, throughquintessential New England mud, torrential rain, and glorious autumn sunshine, and then spent the next two years writing about her adventure. Her her new book, End to End tells a story of physical and emotional struggles and the beautiful bond that is formed when human and canines work together to achieve a goal. I spent the past few weeks reading End to End, and was so inspired by Shirley’s journey on the Long Trail, her relationship with her dogs, and her adventurous spirit. I was lucky enough to connect with Shirley last week to ask her a few questions about her adventure. First of all, why Vermont’s Long Trail? There are obviously lots of thru-hiking opportunities in the Sierras, and I’m wondering what inspired you to drive 3,500 miles to hike in Vermont. I wanted to go someplace green, with plenty of water and cooler temperatures. After living through several years of drought and extreme heat in California I felt parched and as dried out as the crumbs you shake out from the bottom of your toaster. I love the Sierra Mountains of California and it is painful to see the forests turning brown as the trees are dying from bark beetle infestations secondary to drought. On top of it is the risk of wildfire, which is so dangerous and impossible to control in remote rugged canyons. Increasingly we are having to live with smoke-filled skies and toxic air which makes outdoor recreation unpleasant or even dangerous. I was seriously considering declaring myself a climate refugee and moving away from California. For me Vermont had always been the Emerald State in my imagination, with green rolling hills and pastures dotted with brown-eyed cows and small family farms. I grew up in central New York and had fond memories of going skiing in Vermont with my family and with my high school ski club. My brother gets credit for planting the seed in my mind for the idea of hiking the Long Trail. We hiked the Yosemite-Tahoe Trail together in 2012 and he told me about this trail down the whole length of the state of Vermont that sounded like just the right length for a real adventure- in the Goldilocks Zone- not too short and not too long, not too easy but not too hard either, (although I probably underestimated the strenuousness factor!) And importantly, there were no restrictions on bringing dogs on the trail. That is often a limiting factor for me, as they are my constant companions. The biggest factor was that I was in desperate need of a radical change of scenery after taking care of my parents during their last few years of life, and I needed clean break from the deep rut of work and responsibility that had become my life. How did you prepare both mentally and physically for your journey? Lyssa the German Shepherd carried some of her gear in her packLyssa the German Shepherd carried some of her gear in her pack. Mentally I suppose the hardest part was giving myself permission to run away and literally abandon my obligations: my husband, my home, my clinic and the 6 dogs who had to stay home. I knew I needed to do it for my own mental and emotional health, and that eventually they would benefit when I came back stronger and happier and healthier, but it was hard to get over the feeling that I was being selfish. Finally I had a little consult with my inner Dad (I call him that because even though he passed away I still talk to him about stuff and usually get an answer). Anyhow the answer I got back was that I should do the trip, but that I needed to write it up and share it with other people. So writing End to End was my way of fulfilling the bargain! Physically- whenever I got the chance I went hiking. We have a recreation area just up the road with a 9 mile loop hike around a lake with lots of ups and downs- we did that a lot. I figured that I’d have some advantage because most of my hiking out west is at elevations above 6,000 feet and the highest point in Vermont is just over 4,000 feet, but if it made it any easier I sure didn’t notice! I also wanted to make sure the dogs were in condition, especially their feet. Out west the trails are often rough and rocky and sometimes the dogs get sore feet after a few days, especially traversing areas with volcanic rock. I was pleasantly surprised that the Long Trail was very soft on the dogs’ feet- they never got sore or even lame after hiking for three weeks straight! 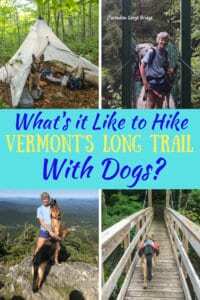 In what ways was hiking with your dogs challenging? In what ways was it rewarding? The biggest challenge was dealing with Lyssa’s predatory instincts. She wants to pounce on everything that rustles or squeaks! She also tends to pull me when on a leash. That was okay when we were going uphill, but a real nuisance when we were going downhill and she’d pull me off balance. It was all good though, because it forced me to work on training and communicating with her, and now our relationship is better than ever. The other challenge was making sure they got enough calories to support their sustained athletic activity, and enough water. I always made sure they were taken care of before I took care of myself. The reward is having the constant companionship of affectionate, joyous, good-natured and devoted beings who will follow me anywhere. Lyssa and Tina taking a break from hiking. Do you have a favorite campsite or shelter? Hmmm, that’s a hard one. Taylor Lodge stands out in my memory because it was such a welcome relief to step into its warm dry friendly space after climbing the Mansfield trail late in the day in a heavy downpour. I’ll never forget the caretaker who offered me strawberries and chocolate chip cookies! 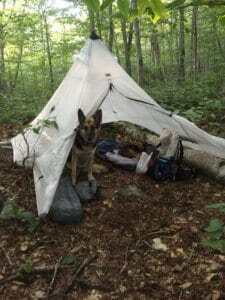 For the most part I preferred my little hyperlight tent with just me and Lyssa and Tina. It always felt safe and cozy, like a den, I suppose. Shirley and her girls, taking in the views. What about a favorite Vermont summit? Wow, I loved them all! Mansfield was absolutely magical because a dense unworldly mist was swirling all around us that morning. I do like a view (who doesn’t?) so Mt Abraham was probably the favorite for the 360 degree view. You could see the Adirondacks and Lake Champlain to the west, and I think it was the White Mountains of New Hampshire to the east. In your book you talk a lot about how your hike helped you process the death of your parents. Was this something you planned for, or was it unexpected? I was very conscious of this trip being a re-birth of sorts, from my life with my parents being alive and part of my world to a new life with them being gone. In a way I knew I would be freer than ever before, even though it was hard to stop obsessing about them. The trail helped me let go of them but also realize that they were still always with me. That part was unexpected! Were you ever nervous or frightened hiking alone? No, but I never felt alone! You meet plenty of people on the trail, and they are almost always friendly and companionable, sharing the same experiences. Of course even when there were long stretches without people I always had the dogs to talk to. They are excellent listeners and never got grumpy or complained. I pretty much always feel safe with Lyssa along. My biggest fears when hiking are getting injured or getting lost. 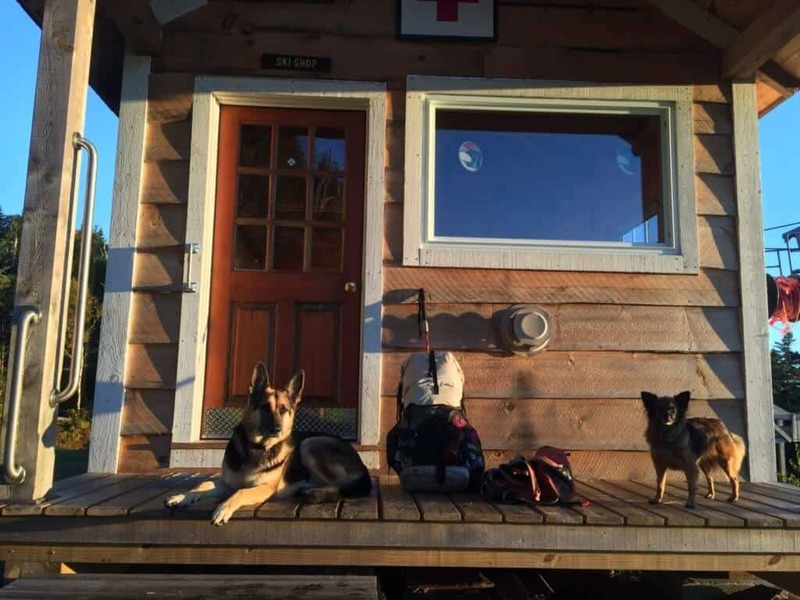 So I always carry a well stocked first aid kit for me and the dogs. I have all the maps and a good GPS app on my phone but I don’t count on it exclusively because phones can go dead, so I carry waterproof maps and a compass. I am very careful to learn as much as I can about the trail ahead and always know where I am, and I watch every step so I don’t fall or slip or get injured. In what surprising ways did your hike on the Long Trail differ from your expectations? It was a lot more physically demanding than I expected. I thought it would be easy compared to the Sierras since it is all under 4000′ elevation, but steep and rugged is steep and rugged at any elevation. How have you changed since returning from your Long Trail hike? Lyssa, keeping an eye on the tent and the gear. I have more confidence in my abilities to meet challenges and take care of myself and others. I also feel more serenity and no longer feel the need to prove anything to myself or the world. I can relax and smell the roses, and just enjoy being present in the journey instead of anxious to get to the finish line. If you could go back and give yourself some advice at the beginning of your journey, what would it be? Pack something besides tuna fish for lunch! Three weeks of eating tuna fish and even your sweat smells like fish- ugh. Bring dehydrated peanut butter instead! Do you have any big hiking plans for the future? Thinking of embarking on your own thru-hiking adventure with dogs? I urge you to order a copy of End to End by Shirley Harman, which is available for Amazon Kindle and in paperback. Shirley Harman was born at the tail end of the baby boom in the 1950s in Cincinnati Ohio. She grew up in upstate New York, and finally put down roots in Northern California in 1982. Shirley can never remember a time when she was not fascinated and awestruck by the natural world- wild plants, animals and the landscape itself. But her early dreams of traveling the world (preferably on foot and with a few canine companions) were set aside for many years as Shirley was caught up in the quest for a career, financial security and the material rewards of success. Then while caring for her parents through their years of failing health and battles with Alzheimers disease, Shirley realized that life was slipping by all too quickly, and the time for seeing the world was now or never. She began sharing her adventures with other people by writing a journal which became a blog of photographic essays in which Shirley seeks to share the passion and appreciation she feels for the beauty of the Earth and its rich diversity of living things. 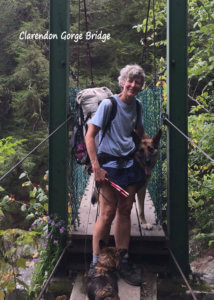 Most of the time Shirley is accompanied by a small, but faithful and enthusiastic coterie of canine companions, who never fail to add another dimension of joy and pleasure to the adventure. 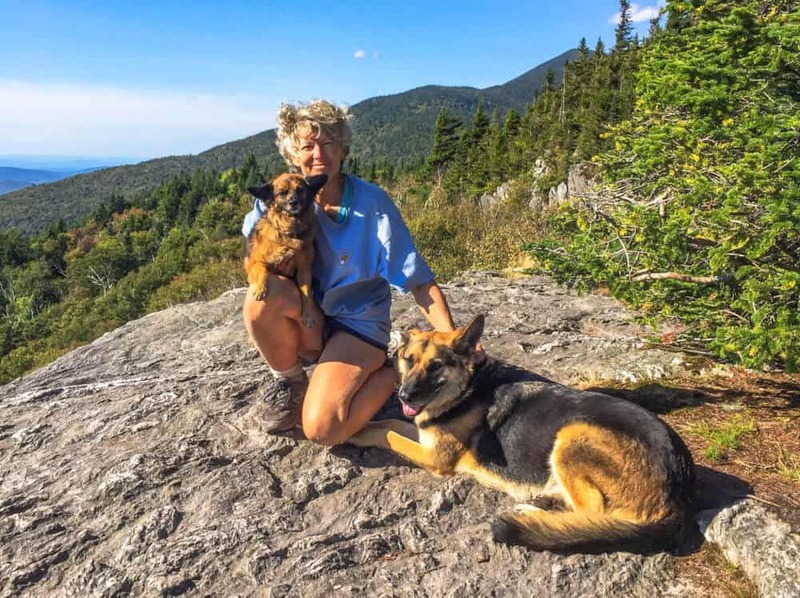 End to End is Shirley Harman’s first full length published book, and tells the story of a transformative backpacking trip with 2 dogs on the Long Trail of Vermont. You can follow Shirley’s adventures with her dogs on her blog, Six Dog Studios. Thank you for the post Tara! So many people have told me that my book inspired them to get out and hike more and even venture out on their own for the first time- it makes it all worthwhile! Happy Trails!